Oakbrook is an Ann Arbor complex with a great location near the U of M stadium, as well as many malls. Adjacent is a beautiful park and within the community is a clubhouse with a variety of courts. There is currently no condos listed for sale and so far this year, 2 have sold. $340,000. 546 Galen Cir. #23, Ann Arbor. 1693 sq. ft., + 800 in the finished lower level, 3 bedrooms and 3.1 baths. Last year at Oakbrook, 2 condos sold with an average sale price of $327,250 and an average price per square foot of $236.00. The 2 condos sold this year have an ASP of $345,500, up 6%, and an A$/SF of $204.00, down 14%. To learn more about condo values at Oakbrook, contact the real estate specialists with The Bouma Group at (734)761-3060 or email info@bouma.com. View more Ann Arbor condominiums here! 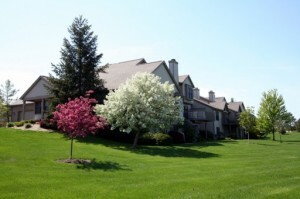 Oakbrook Condos is a small collection of ranch and townhouse style units with a great Ann Arbor location within walking distance of Whole Foods, REI, Panera Bread, Busch’s Market, the University of Michigan football stadium, and multiple shops and restaurants. There are currently 0 units listed for sale and so far this year, 1 unit has sold. 443 Sumark Way, Ann Arbor. $225,000. 1692 square feet with 2 bedrooms and 2.1 baths. Last year at Oakbrook, 2 condos sold with an average sale price of $197,000 and average price per square foot of $115.70. So far this year, the ASP and A$/SF are both up by about 15%. For information on Oakbrook or Ann Arbor Condo values at the nearby Brookside Commons, Cambridge, or Balmoral Park, call the real estate specialists at The Bouma Group at 734-761-3060 or email us at info@bouma.com today!